Ladies Size 12 & 14 Bundle, Next, Gap, Tu, H&M. Condition is Used. Dispatched with Royal Mail 2nd Class recorded. Several used summer items. All good used condition. Some hardly worn. White leggings Dark denim knee length shorts F&F ripped and embellished jeans F&F charcoal denim jeans Atmosphere purple top New Look dark purple vest top with frilled hem Atmosphere black top George striped cowboy style shirt F&F navy and white tunic top H&M orange cardigan (missing button) H&M beige jumper Two Tribes Christmas Jumper Women's Mixed Clothing Bundle Size 10 (12 pieces). Condition is Used. Dispatched with Royal Mail 2nd Class. Wallis jumper black / white. Black classic trousers Atmosphere. 2x Next petite black trousers. Ocean Club black strapless maxi dress. Atmosphere grey/ white dress. Next Petite orange silk long sleeved blouse. Bundle includes Great bundle at just over £2 per item. I live in a house where one person smokes and with cats and a dog. 1 50s style dress. 1 pair of chino jeans from Next. 1 maxi dress. 9Black strap long t-shirt top/dress - Boohoo size 6. 'LADIES CLOTHES BUNDLE'. ANOTHER SIMILAR BUNDLE ALSO LISTED. 10Grey rib crop t-shirt top- 915 New Look age 12-13. 8Black off shoulder top crop - Missguided size s/m. 'LADIES CLOTHES BUNDLE'. ANOTHER SIMILAR BUNDLE ALSO LISTED. 2Paperbag stripe trousers BNWT- Pretty Young Thing size 8. 10Butterfly t-shirt dress- 915 New Look age 10-11. 3Check dress front split - Missguided size 8. Joblot BNWT Ladies PLUS SIZE trousers, skirts, tops and jackets worth £1,390! Ladies Top/jackets/scarf/purses Bundle Sizes 8/10/12. Condition is Used. Dispatched with Royal Mail 2nd Class. Green and yellow punky fish hoody size small (small foundation mark on neck shown in photos). Punky Ariel vest few bobble but still loads of wear left. Large bundle of goth punk rock alternative teen girls ladies clothing bundle. All soft to touch, very good condition. 1 M & S white cotton drawstring trousers - size 12 - never worn. 1 New Look boho mustard wide leg trousers - size 10 - worn twice. (New Look and Primark). 1 Warehouse navy & white long sundress - button front - size 12. The bundle consists of. 11- F&F - dark grey leggings - size 6/8. 6- ABERCROMBIE & FITCH - navy dress - size S. 2- MOTO - black shorts - size 8. 10- ATMOSPHERE - black pencil skirt - size 8. Ladies Clothing Bundle- Size 8 MATALAN navy jumper - 100%acrylic MATALAN Black/White long jumper - polyester/viscose - great with jeans or leggings PRIMARK Coral jumper - cotton/nylon/viscose TOPSHOP pale blue off the shoulder T-shirt MISGUIDED Pale pink T-shirt with unusual neckline. Plain black leggings are M MATALAN stone washed ripped jeans - Size 8 PRIMARK Grey, Pink, dark grey and pale blue slouch tee. Great match for the 2 pyjama bottoms NEWLOOK tartan pyjama bottoms NEXT Navy Fleece star pyjama bottoms EVIE pink flannelette snowflake pyjamas these are 10-12 Great Clean Condition all worn by my teenage daughter who is size 8. 4 x ZARA DRESS. -black zara dress with gold chain around the neck. 3x ZARA BLAZERS. 1x ZARA FAUX LEATHER BLACK JACKET. 2x ZARA PEARLS TOP. -Light grey blazer used. -DARK GREY BLAZER USED ONCE. - Black blazer used once. Majority will be in used condition. Photos are just examples of the clothes previous bundles have included. Evans, M and S, Yours and Next. Large Bundle Of Mixed Clothing , Size S. Condition is Used. Dispatched with eBay delivery – Shutl 2-3 days. Cream lace top, black and white patterned skirt, blue and white striped Bardot top and turquoise shift top are all Zara. Black sequin dress, and white Tshirt are H&M . Black sequin dress is Paprika. Blue shift dress with bronze bead detail is Forever. Powder blue dress is Mango. Blue owl print shirt is Sleep by Beth Jordan. Daisy print playsuit is Factories. Blue print sundress is Bershka. Cream crop Tshirt is GVRD. Cream and black block dress is MNG it has a small mark I'm going to wash it to see if it comes out. Sheer beige sundress is unbranded. Black dress with silver stripe top is American apparel. Fitness space top is All we do. 1 x QED London boxy top size S/M VGC. 1 x Laura Ashley embroidered khaki t shirt top size small well used condition. 1 x Atmosphere Chambray Blue long shirt blouse top size 8 VGC. 1 x Atmosphere Navy Blue & Cream daisy collar top good condition. Ladies Cream Grey Light Brown Tan Casual Ribbed Vest Tank Top Singlet UK Size 12. Atmosphere Ladies Red Sequined Floral Lace Strappy Camisole Vest Top UK Size 14. Atmosphere Ladies Blue Striped Chiffon Strappy Crossover Blouse Top UK Size 14. PARROT SUNDRESS FROM H&M. THIS IS A LADIES CLOTHES BUNDLE - SIZE 16. YELLOW VEST TOP. WHITE LOVE IS BLIND VEST TOP. SHEER BLUE TOP FROM DOROTHY PERKINS. BLUE 3/4 SLEEVE TOP. BLACK CAMI TOP FROM OASIS. All good clean condition with plenty of wear left in them. The black thong is new and unused. George Kids Baby Boys Dark Green White Graffiti Soft Pyjama Trousers 6-9 Months. Marks & Spencer Girls Kids Pink Floral Embroidered 3/4 Trousers Shorts 3-4 Years. Max Kids Girls Pink Purple Floral Frilly Cute Sleeveless Long Vest Top 3-4 Years. A mixture of different clothes all really fashionable, all in really good condition. Ladies bundle size 18. Condition is Used. Dispatched with Royal Mail 2nd Class. However, the interior black leather lining is aged and has started to flake away. This item is a bundle of 14 pairs of ladies shoes with one pair of ladies boots of mixed sizes all used but all in varying conditions from fair to excellent. 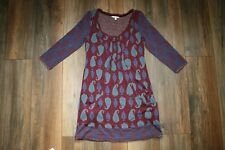 Clothes Tops Bundle womens ladies Small Size 6 8 10 Spring Summer. Dispatched with Royal Mail 2nd Class. This bundle includes 2 x jackets, 4 x Tee Shirts (1 of which is long sleeve), 2 x sweatshirts, 1 x tank top, 1 x pyjama bottoms and 1 x jeans.